Socialized health care rocks – Hello Korea ! So I mentioned to Miwha that I wanted to go to Namdaemun and get new glasses. I’d read that they have a eyeglasses street and that you can get eye exams and glasses really cheap there. So she took it upon herself to set me up for an eye appointment and through her Korean contacts also located an eyeglasses store where we got a friend discount! The eye appointment turned out to be at a laser surgery clinic (for Koreans, not one of the medical tourism places) and it was very slick and super-modern looking. I met her there at Severance Medical Center and the front desk men told me it was closed! I think they just didn’t want to speak English, because I walked around and found it anyway and it was very much open. Miwha translated what my needs were, and an intern ran me through all the usual tests in English. Consulting with the doctor, who spoke amazing English, I found out my prescription had deteriorated a little. His office had a huge video monitor and two computers, and to check for disease they snap a huge photo of your eye for more careful study, so there were my eyes on the screen, about a foot wide each! When I asked about lasek surgery for dry eyes, he seemed to think I would be okay, and due to my need for both distance and close-up, he suggested mono-vision, which means the dominant eye is prescribed for distance and the other eye is prescribed for reading, and somehow despite that mix of prescriptions it doesn’t affect depth perception when looking through both eyes. But I don’t think I’ll do that in the future, but was curious anyway. The best part of the exam was that my co-pay with Korean health insurance was about $7. I didn’t have to bring any paperwork: only present my alien registration card. I’ve been so freaked out about maneuvering through insurance paperwork in a foreign language that I haven’t been to the dentist or doctor the entire 2.5 years I’ve been here, but now I know why other foreigners working here go and get acupuncture and chiropractic adjustments, etc. I’ve been trained to think of those as luxury items or milking the system, but here in Korea they, like eye exams, are included as preventative medicine covered by health insurance! (though, of course, elective surgery is not) And dentistry! Going to the glasses store a couple blocks away at the edge of Namdaemun market was also awesome. I did test Miwha’s patience a little as I took too long to choose frames (because I have champagne taste) but finally I found a pair for distance and a pair for reading (at computer screen distance) that were cheap but would be versatile and classic. The great thing about these eyeglass stores is they grind the lenses while you wait – it only takes about ten minutes! 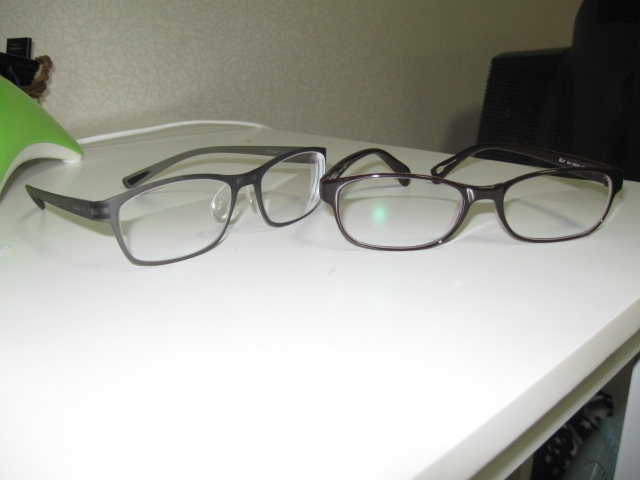 Yesterday, and all year, to be able to see the computer screen I’ve put my glasses on top of my head, as I see better without glasses than with them on, and the bifocals are worthless for that unless I’m in a prone position. So I’ve been one tired cranky girl for the past two years…Today I can see the screen with stunning clarity! And the pair on the left don’t weigh much more than a feather…Cost? $125 for two pairs of glasses. Next payday I’m going to try rigid gas permeable contacts for the first time. And during the next six months I am going to the dentist as much as I possibly can! Yayy Korean medical insurance! Yayy! Korean glasses shops! if we can get politicians here to agree on a national health plan, then this country would be a better place. but i will not hold breath because i do not think this will ever happen in my life time. too many greedy people at all levels. america got ways to go to catch up with some other developed nations in terms of national health plan and public transportation. btw korean health care system is not really socialize medicine. it is more like discounted medicine.